The world’s wealthiest individuals grew richer last year while the wealth of the bottom half of the world’s population went backwards, according to new calculations by Oxfam. The charity made the estimate in what has become its annual attempt to shine a spotlight on planetary wealth inequality, to coincide with the gathering of many of the international economic and political elite in Davos for the World Economic Forum. Using data from Forbes magazine, which keeps track of the fortunes of the richest individuals on the planet, the charity calculates that the total wealth of around 2,000 dollar billionaires rose by 12 per cent between March 2017 and March 2018. It contrasted this with estimates from analysts at the Swiss bank Credit Suisse which suggest that between the middle of 2017 and the middle of 2018 the total dollar wealth of the bottom half of humanity – some 3.8 billion people – fell by around 11 per cent. “The way our economies are organised means wealth is increasingly and unfairly concentrated among a privileged few while millions of people are barely subsisting,” said Matthew Spencer, Oxfam’s director of campaigns. Economists generally agree that the level of global inequality is large and many agree with Oxfam that redistributive wealth taxes are warranted. 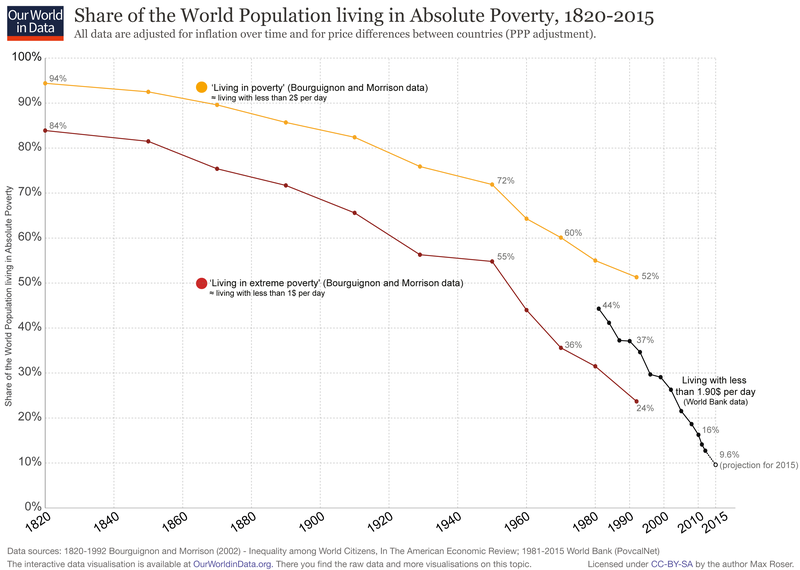 But many analysts also stress that in recent decades the share of the world population living in poverty – surviving on less than $2 a day – has fallen sharply from 44 per cent in 1980 to 9.6 per cent in 2015 according to World Bank data. This is largely due to economic growth in large poor countries such as China and India as they have opened themselves up to global commerce. Branko Milanovic, the pre-eminent researcher on global income inequality, has estimated that international income inequality (as opposed to wealth inequality) fell between 1988 and 2008 for the first time since the Industrial Revolution. The Credit Suisse analysis upon which Oxfam bases its estimate of the fortunes of the bottom 50 per cent of the world population also shows a slightly different story about the trend in the wealth share of those at the top. It found that the share of wealth of the top 1 per cent declined slightly in 2018, from 47.5 per cent to 47.2 per cent. “While it is too early to say that wealth inequality is now on a downward trend, the prevailing evidence suggests it may well have levelled out, albeit at a very high level,” Credit Suisse’s team wrote. Estimating the wealth of those at the very top of the wealth pyramid – not the top 1 per cent but the highest 0.1 per cent, 0.01 per cent and beyond – is difficult because the super-rich do not tend to participate in the surveys that national statisticians use to estimate the broad distribution of wealth.